The Unique Blackbird Savoy Guitar an innovative acoustic with some truly unique features. As guitarists I think that we can be, at times, a little particular about the materials that are used to make our guitars. The combination of tone woods has to be just right to achieve the perfect guitar in terms of aesthetics and tone. However, regular readers will be aware that questions exist over the sustainable supply of the exotic hardwoods used to manufacture guitars. We covered the issue of sustainable wood in a recent article which can be found here. That is why we were interested to discover Blackbird Guitar and the innovative way that they are using Ekoa to make beautiful and amazing sounding guitars. Blackbird Guitars was founded in 2005 by designers Joe Luttwak and Kyle Wolfe. The pair were trying to find a compact guitar that they could take on their travels. However, no matter how hard they looked they found that the travel guitars that were on the marketplace were not up to the job. In essence they concluded that the guitars available didn’t have a great sound and were a touch on the fragile side. So rather than give up on their quest they instead decided to build their own and Blackbird Guitars was born. Now if you are going to design a new high tech product it helps if you have some experience. Fortunately both Luttwak and Wolfe come from a design background so were used to creating new products. However, neither had created a guitar before. As part of the design process Luttwak and Wolfe drew on their past experience of designing high tech products. After many concepts were created and prototypes built the resulting instrument, the Rider, was released. The Rider was a fusion of traditional guitar luthiery and cutting edge high performance raw materials and was the first hollow unibody guitar made of composite materials. They continued to experiment with carbon fibre guitars and in 2009 released an OM sized steel strung guitar called the Super OM. 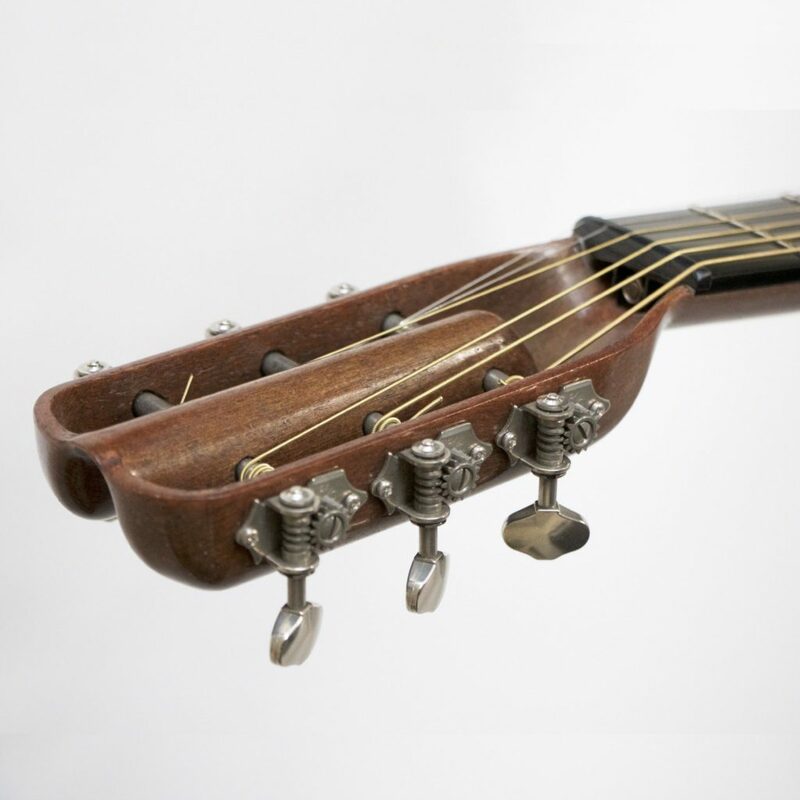 As well as guitars the company also built Ukuleles and in 2013 they built their first instrument made from Ekoa. Ekoa was developed by Blackbird Guitars to overcome some of the perceived drawbacks of other composite materials such as carbon fibre. The complaint was that although composite instruments made with carbon fibre, glass fibre or aluminium were very durable they did not have the same tonality as guitars made from wood. Ekoa, an innovative and unique material designed by Blackbird Guitars, utilises flax fibres and produces a tone more akin to a traditional wooden bodied guitar. Because the material is largely composed of flax fibres the material doesn’t need decades if not centuries in the ground to grow and is extremely sustainable. This fits nicely if you are worried about the sustainability of modern guitar production. 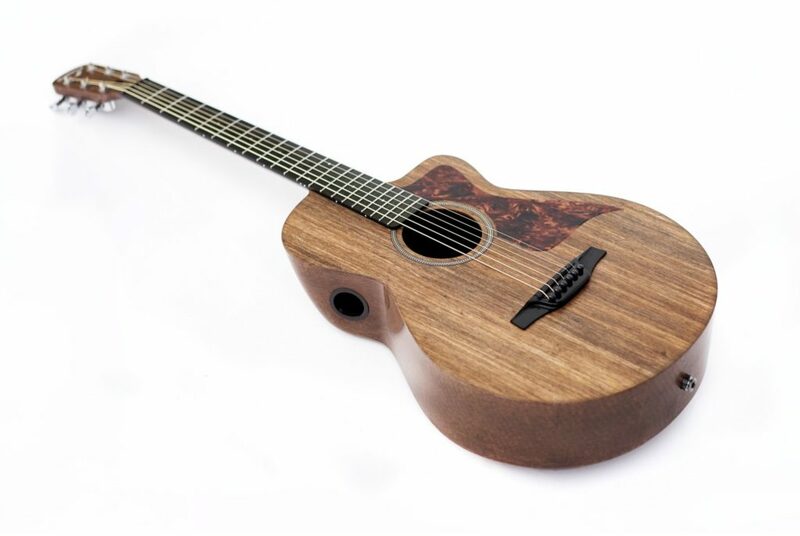 Having successfully produced a Ukulele from Ekoa in 2013 Blackbird Guitars could see the potential of the material to create a hollow body acoustic guitar. In 2014 they realised that potential and released their first guitar, called El Capitan, made completely from Ekoa. Shortly after they launched the second guitar in the Ekoa range the Savoy. How are Ekoa Guitars made? Ekoa is a 50:50 mix of flax linen fibres and resin. The pieces of Ekoa are laid into a mould and then subjected to high temperature and pressure for a few hours. Once set the one piece body, that is the body and neck of the guitar, can be removed from the mould and the top soundboard is bonded in place. The construction process, involving only two pieces which creates a very strong and durable guitar with excellent sound and tone properties. Luttwak states that “The guitar is resonating in unison rather than separate parts that are at odds with each other”. What are Blackbird Guitars like? The Blackbird Guitars El Capitan has a novel neck and headstock design which gives the guitar a more resonant tone. The El Capitan is a jumbo acoustic guitar where the body, neck and headstock are all one piece which gives better resonance and sustain. The added advantage of the one piece body is that there is no heel at the junction between the neck and the body. This makes it easier to fret higher up the fretboard allowing you to take full advantage of the 20 fret neck. The neck of the El Capitan is hollow which, it is claimed, gives the guitar stereo sound as the neck acts as a complimentary sound box to the body. The innovative slotted headstock is also lightweight but very strong and has an increased break angle over the nut. This is good because the steeper angle pulls the strings down with greater force into the nut reducing things such as string buzz on open strings but more importantly gives a better tone to the guitar. The second model, the Savoy, is a more compact “O” sized guitar but it still packs a punch with a full resonant sound due to the Ekoa material and unique Blackbird design. As with the El Capitan the one piece design is extremely strong but durable and weather stable so is a go anywhere guitar. The video below demonstrates the Savoy in action and captures nicely the big sound of this beautiful little guitar. Blackbird Guitars, in their quest for the perfect travel guitar, have created something totally unique. They have challenged our concept of what constitutes an acoustic guitar. They have created a new and sustainable raw material for the construction of their guitars and they have introduced some revolutionary design features with the aim of creating the perfect resonant tone. Are they beautiful guitars? Yes I think they are and for that Blackbird Guitars deserve all the success they are getting. To find out more about Blackbird Guitars visit their website.